Last Saturday Elisa and I braved the rain and wind to go to Fairfield CA to see a quilt show we have never been to before. It was a hard decision, as Yuba City's quilt show was the same day, and we only had one day to see one. It was a nice show. It was held in the Senior Center, and it used every room in that building. The quilts, as usual, were beautiful. See the pictures of some below. The people there were wonderful, and there were great vendors. Many of them were different than we were used to seeing, which is always fun. There was one vendor that had fat quarters for 25 cents a piece! Yes, 25 cents! So I bought a lot. I have been working on a couple of applique quilts that needed springtime, bright and cheery colors, which were in there. I think Elisa bought twice as many. You can never have too many fat quarters, especially if you are an appliquer. Marjan Kluepfel was their guest artist. She, personally, was not there, but she had a whole room dedicated to her quilts. She is remarkable in what she does. I especially love how she did some of the 3-D work on her quilts. There is an undersea quilt that looks like she captured the seaweed and put it on her quilt. Great work. This quilt was unbelieveable! It is Mother Teresa done in fabric and just stunning in its scope. The vendor that had the inexpensive fat quarters [thank you very much] had this quilt on display. I have the center flower panel at home and have been wondering what I was going to do with it. She gave me permission to take a picture of it, so I could remember what she did. I love it. Her business is Merrill-Lee Designs in Sacramento. The next few are from the featured artist, Marjan Kluepfel. I love cityscapes. Her featured quilts were wall quilts and this one was one of the smaller ones. It really caught my attention, though. I loved this one for its size and use of color. She had a pattern and hand dyed fabric for sale. Had I not already bought a lot of fabric from the vendors, I probably would have bought some of this and tried this one. The size was narrow but quite long. It is probably 4+ feet long. When I mentioned the featured artist above, I stated there was one with 3-D seaweed and plants on it that was stunning. This is it. A photograph does not do it justice. Love Christmas quilts. I especially loved this one with all its different blocks depicting Christmas. Here is another Christmas quilt that is so beautiful. It looks fairly easy to make, too. One reason I love going to quilt shows is to get ideas for more quilts. Not that I do not have plenty already picked out to do. The above one is going on my list. Being March, there were not too many Halloween quilts. This one was extremely cute, and I figured it would be my token Halloween quilt that I always post. Then I saw this quilt. This is not necessarily Halloween - just fall. It is so cute. I especially like how they used different backgrounds on each block and quilted it with stitching running through the blocks. This is a version of the Mexican Star pattern. In our store a teacher taught this class. It was really popular. Recently I had a customer call to see if I still had a pattern to sell her. I did not, but I ordered them. 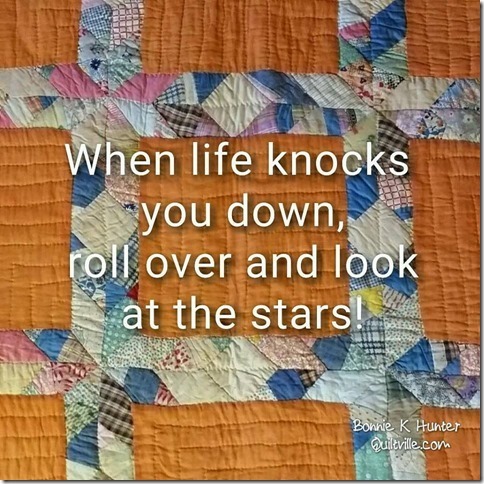 So if you are interested in doing a quilt like this check out the pattern at http://www.beehivequilts.com/mexicanstars, if you are interested. This particular quilt took best in show. If you saw it personally you would know why. This is an unique applique that I loved. See the next picture for more explanation as to why. It might be hard to tell from the picture. The flowers were done by taking two circles of fabric and sewing them together. The back side was sewn to the background and the front was gathered and pulled tight to form the front of the flower. It really made each block "blossom" out. Quilters have their own day. What a wonderful situation. We have an excuse to everyone around us that March 19th is our official day to do nothing except sit down and quilt! The 19th is this coming Saturday! I already know what I am going to do. There are two quilt shows in our area. I am going to go see those. One is in Fairfield CA. It is North Wind Quilters Guild Cover Story XIV Quilt Show. It runs Saturday and Sunda from 10 a.m. to 4 p.m. at the fairfield senior center. For more information go to http://www.northwindquiltersguild.com/. The second one is the Valley Quilt Guild's Bloomin' Fun! It is their 28th annual quilt show. It also is March 19th and 20th from 10 a.m. to 5 p.m. on Saturday and 10 a.m. to 4 p.m. on Sunday. It is heald at Yuba-Sutter Fairgrounds in Yuba City CA. 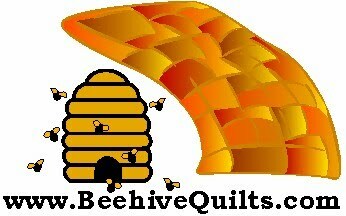 For more information go to http://www.valleyquiltguild.com/. What could be more fun to celebrate National Quilting Day than to go see beautiful quilts and shop the vendor displays.